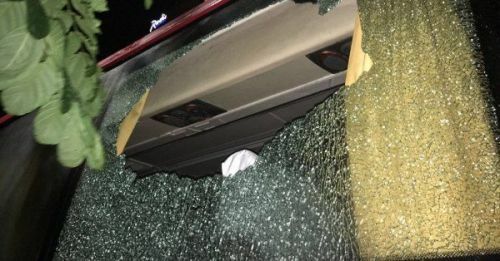 A section of Indian fans in Guwahati was out to apologize to the members of the Australian cricket team after a stone was thrown at the team bus following the second India-Australia T20I. Most fans in the gathering were out in front of the team hotel, as the Australians were leaving for Hyderabad, with placards that read 'sorry Aussies' and labelled the incident as a 'shameful' one. Australian cricketers took cognizance of the show as all-rounder Moises Henriques acknowledged the gesture and tweeted his appreciation. Whilst the bus home last night wasn’t ideal, the support from fans & children across Assam today in response was kind. Cheers 2 good vibes?? The act was condemned by sportspersons and fans alike and an inquiry was immediately initiated. So far, two people have been arrested by the police. Adam Zampa, who helped curtail India by picking up two wickets in three balls, felt that the incident wasn't reflective of the behaviour of all India fans. "The Indian fans are so great to us, which is one of the reasons why it's so hard to travel here. They're so loud, they love cricket and they're so passionate about it," Zampa said. "Guwahati doesn't get much cricket as it is so for one person to do that and to spoil it for the rest of the Indian fans, it's pretty disappointing," he added. Both teams have reached Hyderabad for the third and final T20I of the series, which would also be the decider with the equation now tied at 1-1. India had won the first T20I in Ranchi by 8 wickets. Incidents of unprovoked aggression by Indian fans isn't new. In 2015, during a T20I between India and South Africa, unruly behaviour by the crowd had forced the umpires to put the play on hold. Fans were seemingly dissatisfied with India's performance in the match - India were bowled out for a paltry 92. The play was held up until a particular section of the crowd was cleared from the stands. More recently, during an India-Sri Lanka ODI in Pallekele, unhappy fans hurled plastic bottles towards the playing area forcing the umpires to stop the game momentarily.